**CARFAX 1 OWNER, **RETIRED POLICE VEHICLE, **LOW MILES, **POWER WINDOWS, **POWER LOCKS, **POWER/HEATED SIDE DOOR MIRRORS, **BLUETOOTH, **AUTO-DIMMING REAR VIEW MIRROR, **AUTOMATIC CLIMATE CONTROL, **AUTOMATIC HEADLIGHTS, **CRUISE CONTROL, **TRACTION CONTROL, **SERVICED, **DETAILED, **PRICED TO SELL FAST, **THIS VEHICLE INCLUDES THE FOLLOWING FEATURES AND OPTIONS: 18 Heavy-Duty Steel Wheels, 4-Wheel Disc Brakes, a 600 CCA Auxiliary Battery for those cold mornings, ABS brakes, Air Conditioning, AM/FM radio, AM/FM Stereo w/CD Player, Automatic temperature control, Brake assist, Bumpers: body-color, CD player, Cloth Seat Trim, Compass, Daytime Running Lamps & Automatic Headlamps Delete, Delay-off headlights, Driver door bin, Driver vanity mirror, Driver's Side Spot Lamp, Dual front impact airbags, Dual front side impact airbags, Electronic Stability Control, Four wheel independent suspension, Front anti-roll bar, Front Bucket Seats, Front Bucket Seats w/Cloth Rear Bench, Front dual zone A/C, Fully automatic headlights, Grille Lamps & Siren Speaker Wiring, Horn & Siren Circuit Wiring, Illuminated entry, Knee airbag, Limited-Slip Differential, Low tire pressure warning, Occupant sensing airbag, Outside Heated Power-Adjustable Mirrors, Overhead airbag, Panic alarm, Passenger door bin, Passenger vanity mirror, Power door mirrors, Power driver seat, Power passenger seat, Power steering, Power windows, Rear anti-roll bar, Rear reading lights, Rear window defroster, Remote keyless entry, Speed control, Speed-Sensitive Wipers, Steering wheel mounted audio controls, Tachometer, Telescoping steering wheel, Tilt steering wheel, Tire Pressure Monitoring System, Traction control, Trip computer, and Variably intermittent wipers. 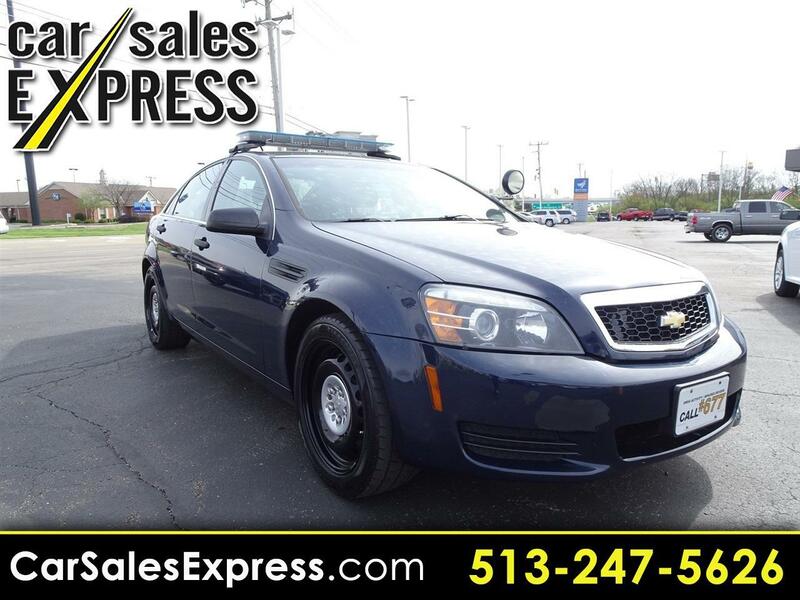 ** We offer Market Based Pricing, please call to check on the availability of this vehicle. We'll buy your vehicle even if you don't buy ours. Our quick, no haggle experience allows you to buy easier and faster. standard speaker system with 2 tweeters Includes 2 speakers. Message: Thought you might be interested in this 2013 Chevrolet Caprice Police Patrol Vehicle.